Dr Sarwar’s letter to the Editor – an obituary for Manzarul Hasan, Editor of The Leader eveninger, his older brother Akhtar’s friend. I remember typing it out for him, and it being printed in Dawn, but can’t find the date. It was some time in 2002 I think. beena. Thanks for sending the reports and other attachments relating to the memorial meeting for Sarwar held yesterday in Karachi. I had been eagerly awaiting it. I know it is trite to say it, but I really wish I were there too. But even the reports and attachments helped me relive one of my most precious friendships. Surely, the impact of being in the meeting and seeing and listening to others close to him, including those I have never met again since 1950s – even those I may have never known – would have been immensely more profound. I will probably never get a similar opportunity again. Somehow I can’t but recall the death of Akhtar, his older brother, who died 50 years earlier. At that time I was in London and Eric Rahim, who was a close friend and colleague of Akhtar and the two were in some ways mentors of those of us who were engaged in student activism under Sarwar’s leadership, had just arrived to study economics at University College, after having resigned his job at the Pakistan Times. I recall spending a whole week-end at Eric’s digs in Hampstead to try to overcome the grief that we both felt at Akhtar’s sudden and premature death, soon after getting the news. Eric and I reminisced together not only the charming personality of Akhtar, but also the brief period of about five years in which the Left movement, especially in Karachi, was at its height and on which, as Eric rightly points out, Sarwar has left an indelible mark.. 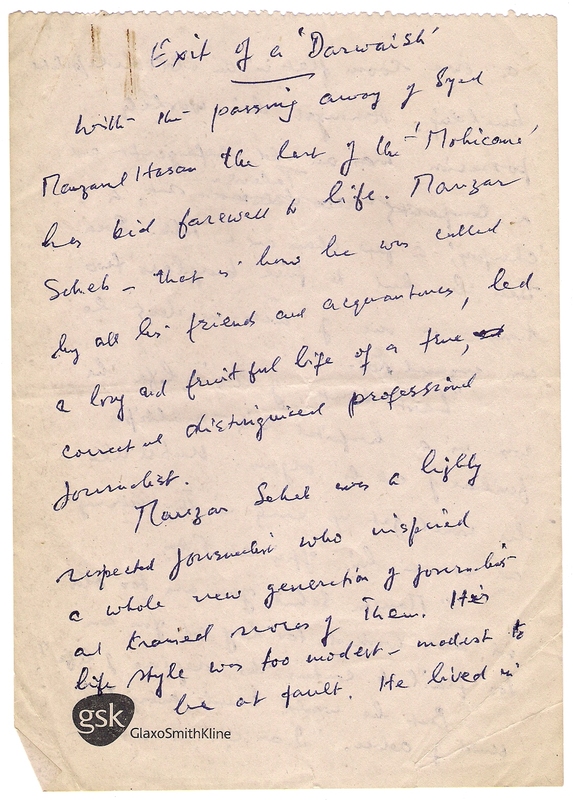 I also recall that Sarwar, who rarely wrote personal letters, sent me a long aerogram detailing the circumstances of Akhtar’s illness and emotionally telling me how bad he felt that, despite being a doctor, he could do little to save someone who was not only his brother, but also his inspiration. Sarwar lived a much longer and fuller life and although family circumstances – especially Akhtar’s early death – did not allow him to lead a more active political life than he probably would have wished to and was certainly capable of, his intellectual influence on and inspiration to his friends and colleagues was enormous. His magnetic personality not only brought large crowds to the student meetings, but also attracted a large number of friends to his house in Karachi – from PIB Colony to Jamshed Road and finally to Clifton, where he and Zakia brought up you and your siblings. I knew Sarwar and his family intimately and was a frequent visitor to his home before you were born. His three younger sisters, Shahida, Rashida and Saeeda, as well as Sarwar’s parents, treated me as a member of the family and I still remember with great fondness the time I spent with them in their modest house in PIB Colony. Saeeda Gazdar & Sibte Hasan in Stockholm, 20 Aug 1985 or 1986. After leaving Karachi for studies abroad and later after settling down in Islamabad and, later still, working abroad, my contacts with Sarwar’s family became more tenuous, but I continued to remain in touch with him whenever I went to Karachi. Somehow meeting Sarwar made me feel reconnected to not only him and his family and friends, but also with the whole world. I always found him reading books and intellectually alive and having a sense of direction about where the world was going. His laid back style and taking things in a stride put one at ease and made on forget one’s own troubles. He encouraged me to write, both in my student days and later when I started writing for the newspapers and occasionally took me to task for writing what he did not agree with. I don’t know whom can I turn to for that kind of support and frank advice now. Sarwar was fortunate in marrying Zakia, who provided him a home and a family which made him happy and proud. In later years, Zakia was the sole earner in the family as both Sarwar’s health and the law and order situation in the area where he practiced had deteriorated considerably. Even before that she had established herself as a distinguished educator and had established a reputable NGO for teaching English – a subject which my wife Zarina also taught, which allowed her to have her own preoccupation and friends, even as she entertained and enjoyed the company and interests of her husband and his friends. I was often amazed at her ability to do so. I suspect the failure of her initial efforts to “reform” Sarwar, proved a blessing in disguise. Sarwar’s friends, I in particular, must be thankful to you for making us realize and others aware of his greatness and humanity and the inspiration he provided to our own and succeeding generations of youth. You and your work as a journalist and human rights activist are a living testimony to the legacy he has left behind. Please give the best wishes and love from Zarina and myself to Zakia and to all the members of Sarwar’s family who have always enjoyed the deepest respect and love in my heart. I feel especially sad for Saeeda and wonder if she at all realizes what has happened. The piece she wrote after Akhtar’s death still reverberates in my mind. A second loss after 50 years would have reopened her wounds. Please give my love and commiseration to Haris, who was also a great admirer of his Mamu. Love also to Maha, who was great as her Nana’s keeper and did not let him exceed his quota of cigarettes.